The Junior Jet Club is an interactive play area for your young aviators up to 6 years of age. 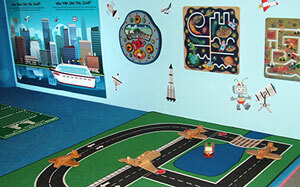 Young aviators can build, explore and even settle down for a story in our book corner. The Junior Jet Club is included with museum admission or you can enjoy it without the rest of the museum for only $2.50 per person. The cheapest play-date in town! The Junior Jet Club is open from 10:00 am to 4:30 pm. The Junior Jet Club is an area designed specifically for young ones up to the age of six. The colorful space incorporates many hands-on, aerospace themed activities from engineering with Legos and constructing roaring rockets from blocks to exercising on the space station and collecting moon rocks! Little pilots can command a space shuttle cockpit; take passengers on a world flight or go where ever their giant imaginations can take them! The Junior Jet Club even features a Reading Corner, a cozy nook specifically designed to encourage reading. It includes child-friendly furniture, shelves of library-quality books, a magnetic wall for spelling and counting and a teaching area for programming. The Junior Jet Club was made possible by funds donated from Albert Isaacson in memory of his wife Leatrice Isaacson; along time volunteer at the Cradle of Aviation dedicated to education. Funds from the Target Early Childhood Reading Grant have allowed the museum to develop and conduct the support programming for this exciting addition.